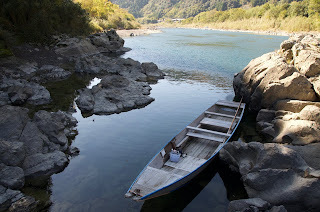 Yesterday a friend of my contact Mr. Shibafuji took me to the Shimanto River. The itinerary was to meet three boatbuilders there, two working upstream and one down near the mouth. The Shimanto is the only major undammed river in Japan, and its isolation probably explains why there are this many craftspeople building boats. 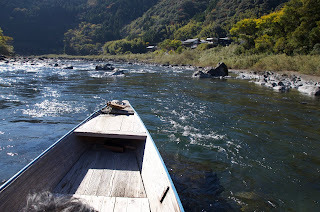 In fact most of the boats I saw on the river were wood, and even the fiberglass ones are modeled on the traditional designs. My companion Mr. Takaoka was intrigued by a building he saw on a hill so we drove up. 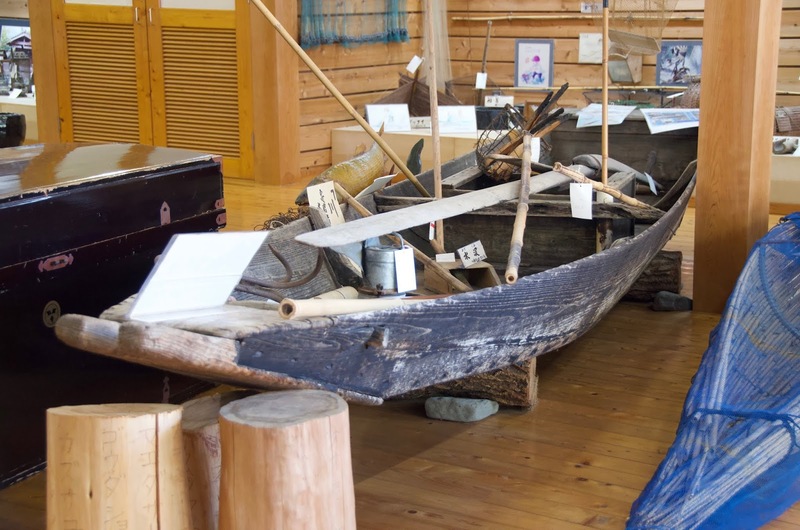 What should be find but a small, local museum with a traditional boat out front. We immediately set to work measuring it. This could be an ideal design for someone interested in building their first Japanese boat. Note the bow which is a flat board cut at the top into two horns. The anchor line passes through this notch. The boat is about thirteen feet long with very thin planking and two sets of grown frames. 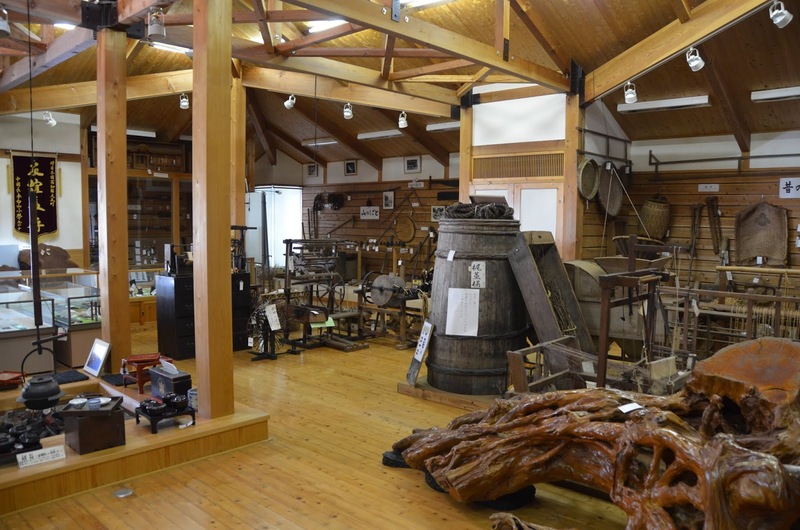 Inside the museum was stuffed with artifacts, all from the region which is deep in rural Japan. 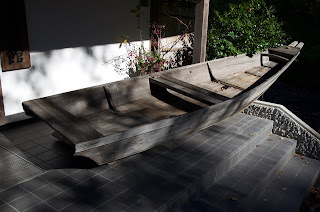 Including a larger version of the boat we saw outside, this one sixteen feet long. 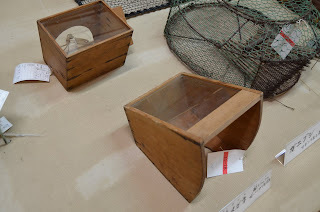 This is a fishing boat and the museum had all kinds of nets and traps for catching fish. ... a primitive face mask for spearing fish in the river. 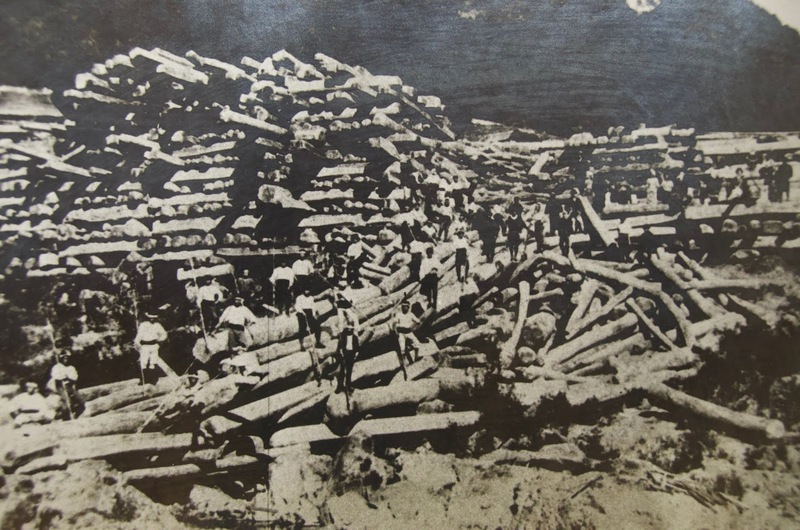 Lumbering and charcoal-making were important industries. 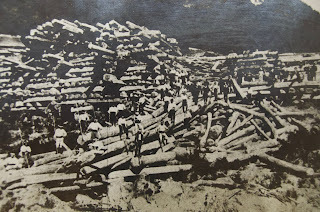 Historic photo of a log pile. Before meeting the first boatbuilder we took a boat ride. 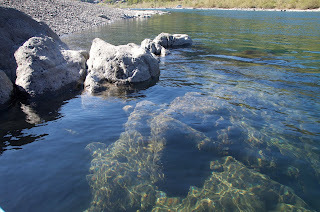 The river is very low so the stretch we traveled was quite short. These boats were built by two of the craftspeople we were scheduled to meet. The waters are about the clearest I have ever seen anywhere. A short run of rapids on the way back. 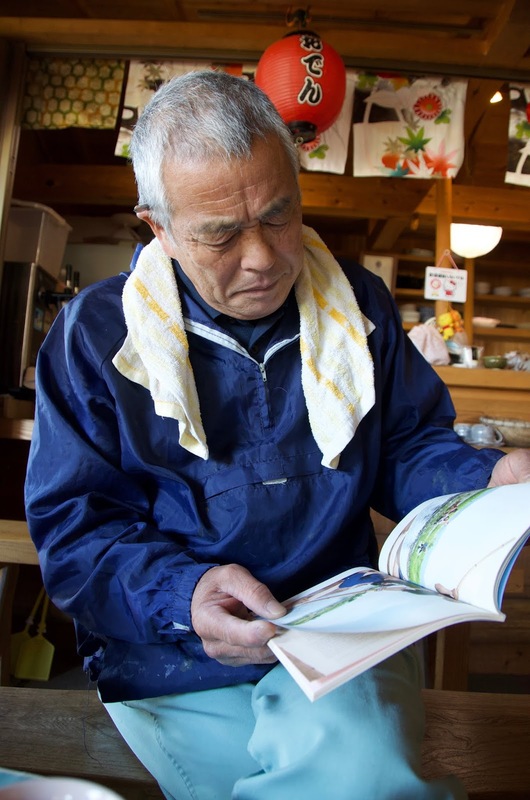 Mr. Kawakami, 68, was a house carpenter who took over three years ago from the former boatbuilder in the region. He has built six boats now, for both fishermen and the downriver tour company. 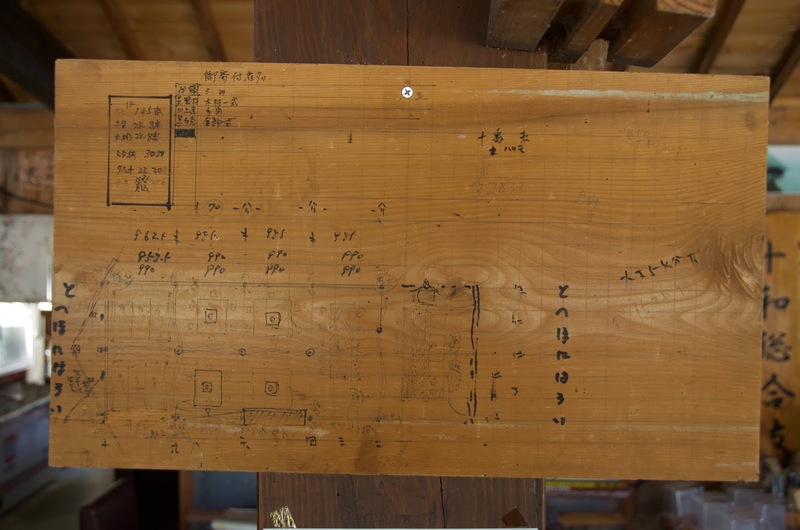 He built the restaurant where we met and his plans, drawn on a plank, were nailed to a post. 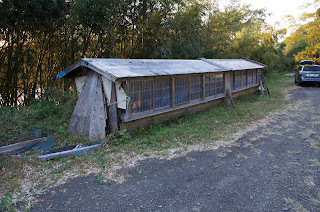 As we chatted about boatbuilding he suggested we step outside to see the bottom of a large, old river boat. 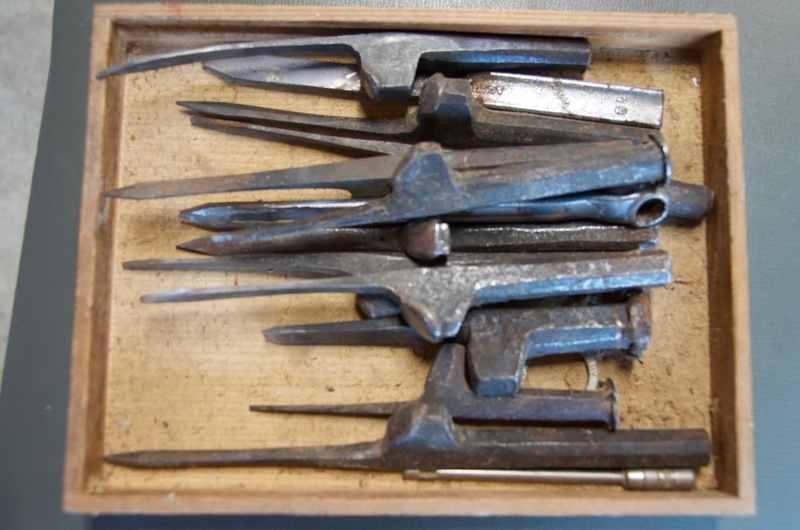 He said he's taken to pulling nails from old wrecks to replenish his stock. 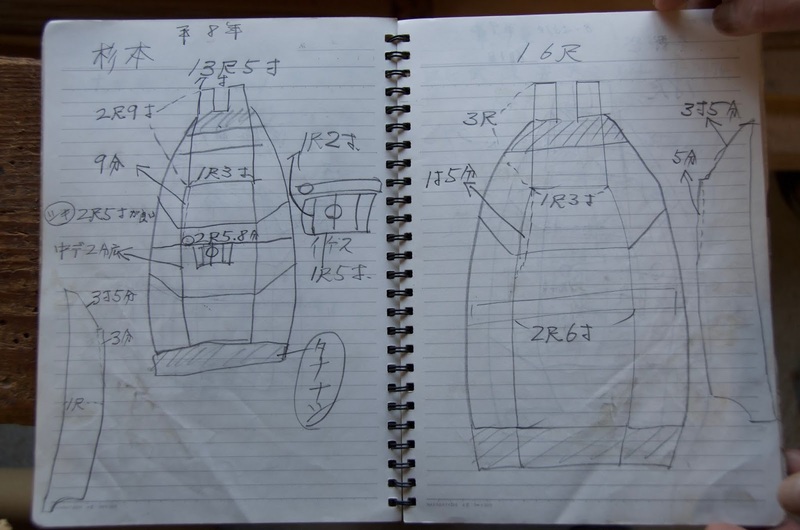 This is a really bizarre construction detail found on this region's boats. 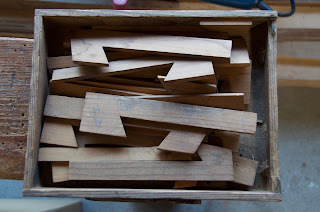 The timber on the right is the bow plank/stem and on the left the bottom planking. The latter is beveled at the end and this is inserted in a notch in the stem. 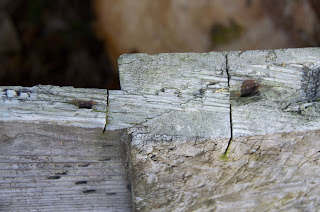 You can see the joint between the two saw cuts. 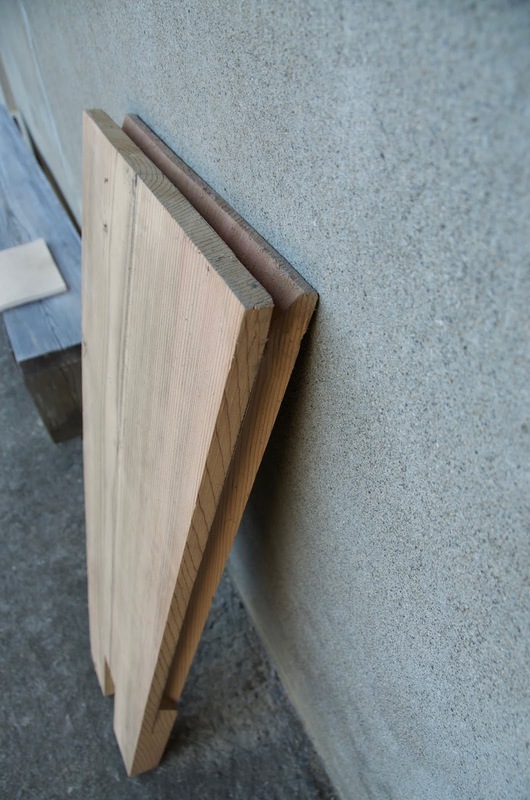 No glue or fastenings are used; when the side planks are fastened it holds everything together. 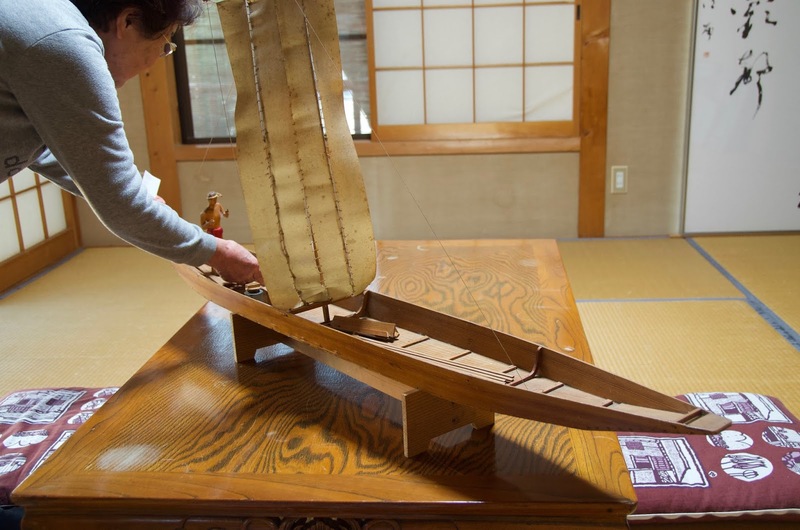 The bow plank is called the neushi and the name may refer to the two points which resemble horns ("ushi" means cow). From there we went to visit Mr. Nakawaki, the man who retired. He is 83 and a third generation boatbuilder. He built boats 16-20 feet long and says he built 300 in his career. He claimed his father built 1,800 boats! 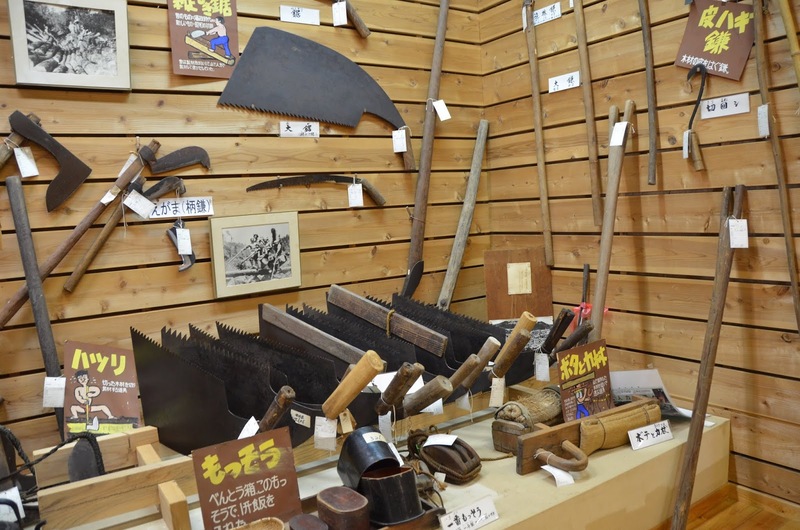 He had really interesting short tsubanomi for piloting nail holes. I've never seen any like this before. 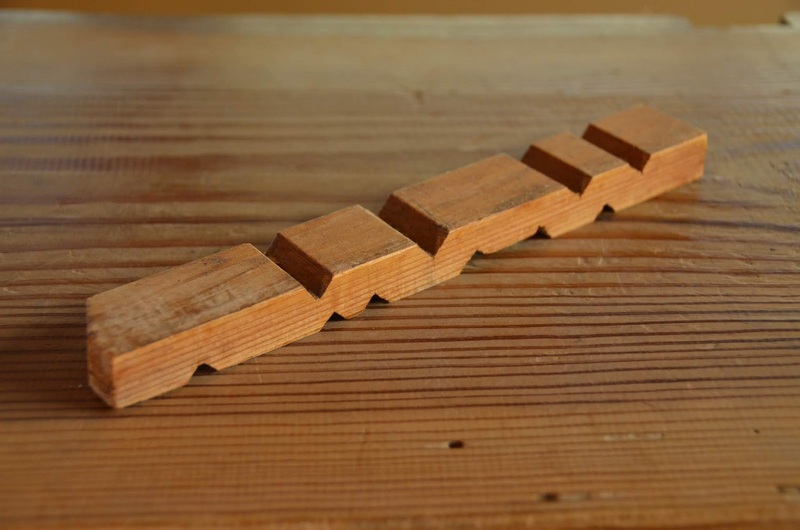 He built without drawings, relying on memorized dimensions and these patterns for angles. 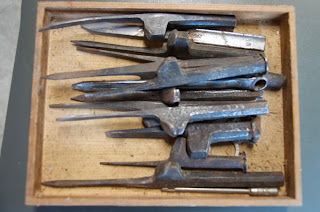 This was a fantastic little tool: a scribe. You can insert a pencil in any of the notches to get the offset you need. 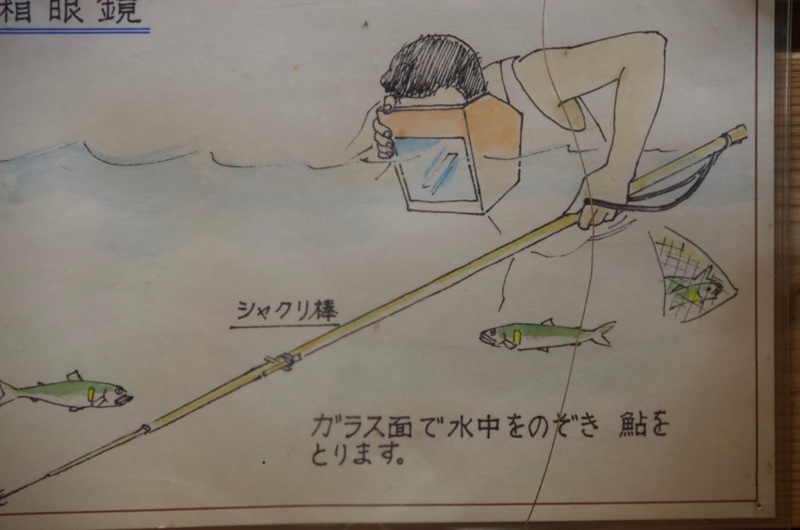 Interestingly, Nakawaki san had a book in which he recorded dimensions for river boats throughout western Japan. 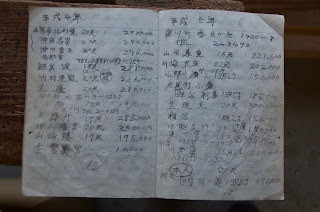 He also had his ledger of boats sold, with the year, customer's name, length of boat, and price. 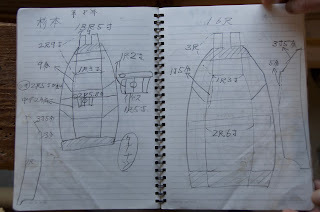 Here are his pages for 1993 and 1994. He built eleven and ten boats respectively those years for prices averaging about $2,000 USD. If that sounds absurdly low IT IS! 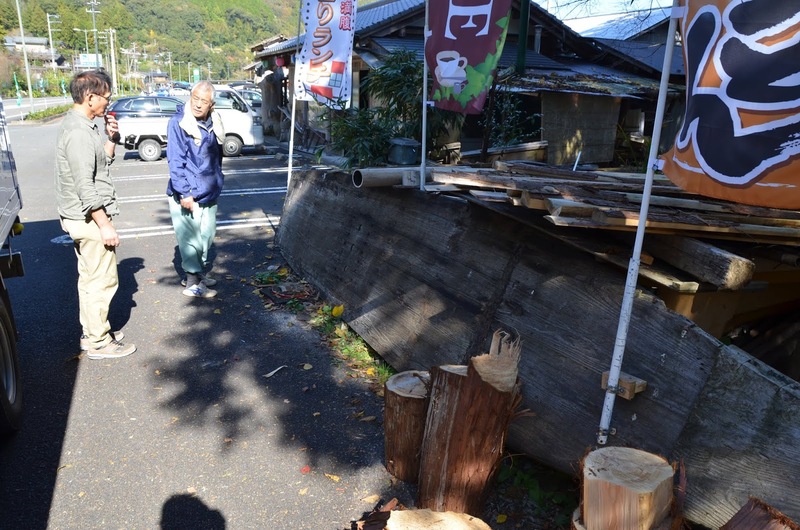 However, Nakawaki said he could build a boat in 10-15 days and customers supplied the wood. 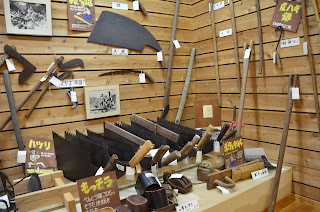 Still, one of the realities of rural Japan are the hard work and low wages. I've found that while there are still markets for wooden boats customers have an expectation of price that no young person starting out could ever live on. 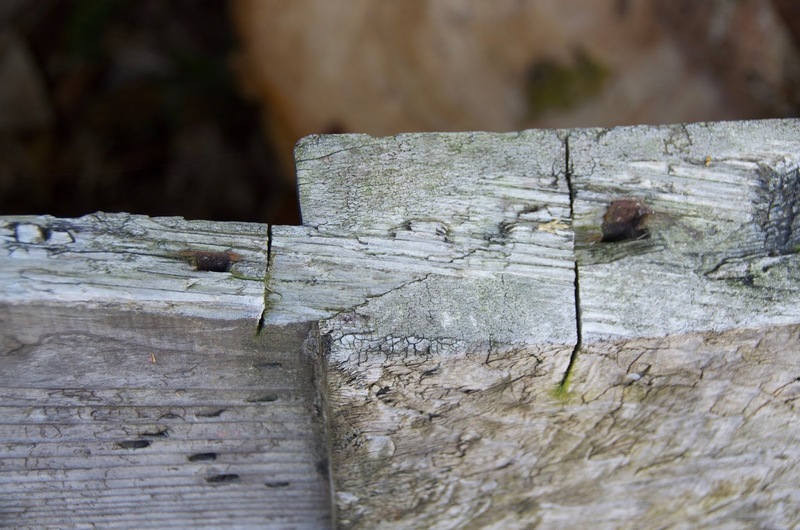 Its a real problem furthering hastening the demise of wooden boatbuilding. 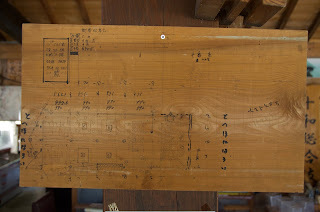 We were trying to get more details on the neushi bow plank and lo and behold Mr. Nakawaki had one, so I was able to get details of the plank rabbets and the notch. From there we drove downriver and found Mr. Kayou. 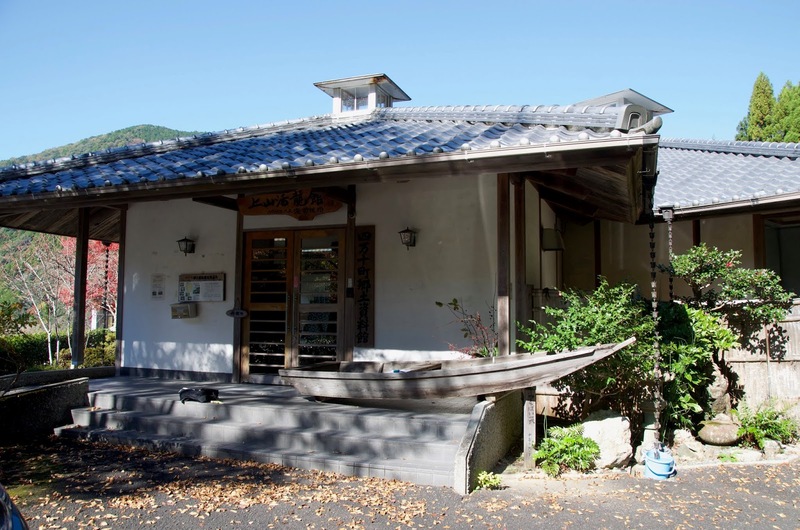 In his yard were two old yakatabune he built. 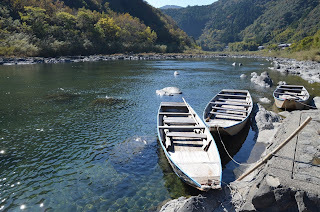 These are party boats and note the bow cut off and leaning against the end. 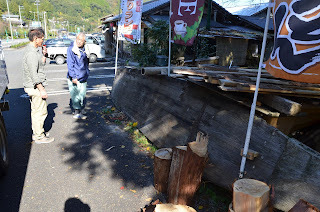 Unfortunately Mr. Kayou is very hard of hearing and he made it clear he had no interest in talking to us. 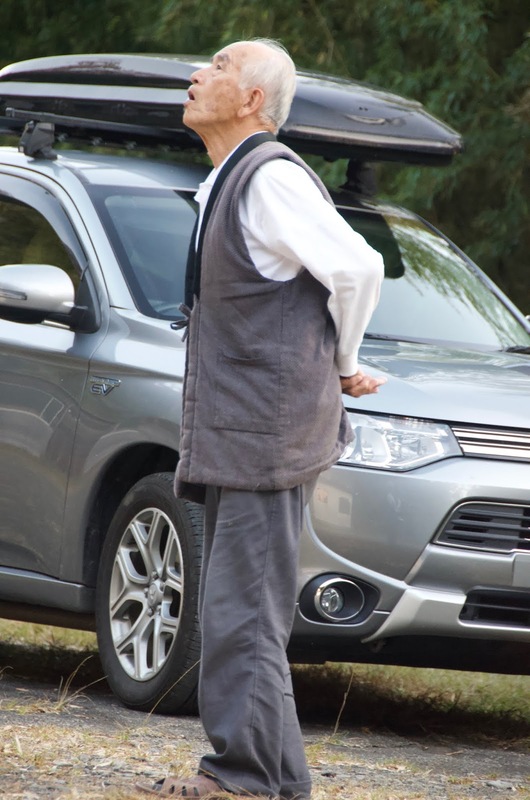 He is 87 and has been retired for about ten years. His wife was kind enough to tell us a few things. 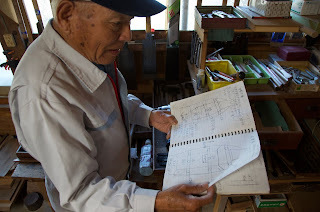 Kayou is a third generation boatbuilder and most of his boat were eight meter fishing boats. 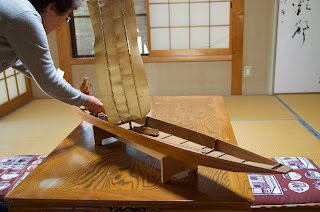 She showed us this model her husband made of a senba, a local sailing cargo boat used to transport charcoal downstream and take rice, soy sauce, and miso upstream. She said her husband's grandfather used to build them. The model is 1/10th scale so these boats were 13.2 meter long, 1.8 meters wide and .55 meters deep with a 6.25 meter mast. Not all days are like this in Japan but over the last twenty-eight years here researching boats I have had many extraordinary visits with craftspeople. 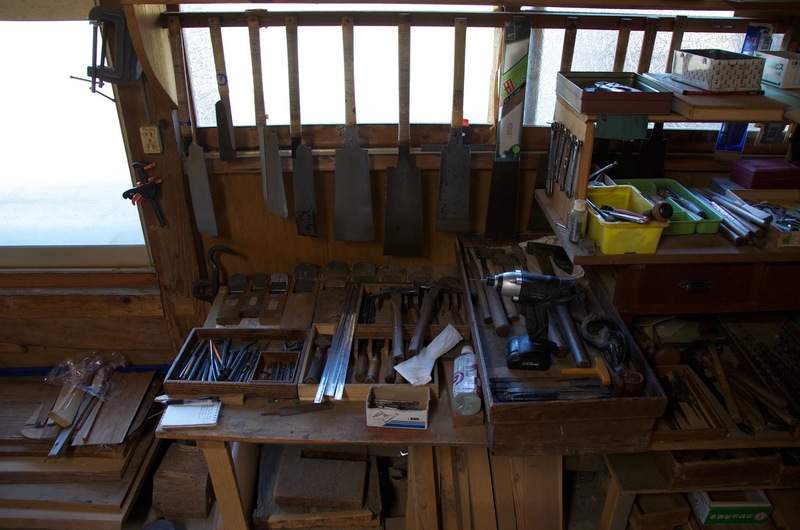 Sadly, this last generation of boatbuilders has almost disappeared.